Awake, wholehearted, and seeking—these are some of the very best qualities of the fire signs of Aries, Leo, and Sagittarius. These qualities shine like a beacon in this month of Aries emergence. The current lunar cycle* began at the very last degree of Pisces, just a moment before both the Sun and Moon entered Aries together. So, though technically the seeds of the current lunar cycle were planted in Pisces, the real energy of this cycle has been sourced from Aries. This month’s super-charged Aries experience was set up by last month’s transits: Uranus in Aries making its final square to Pluto, Venus and Mars forming a conjunction in Aries, and Mars joining Uranus to really, really make sure we woke up. Are you awake yet? The fire pattern goes like this: After awakening (Aries) comes wholeheartedness (Leo), after wholeheartedness comes the adventure (Sagittarius), and the adventure often leads us eventually to a new awakening. This is a hero’s journey. Fire signs evoke the heroic qualities we each have within us. True heroism is vulnerable and curious. The true heroic journey may take us away from the world only to show us a new world in which we really belong. But that is skipping ahead. Right now with the stars as our guide, we focus on waking up. When you first wake in the morning, what grabs you? Is it the desire for that first cup of coffee? Is it the plan for the day? Is it any number of woes or joys that might come your way? It is far too easy to be grabbed by thoughts in the moment of awakening. Special gifts come from staying with the present moment, however. This special lunar cycle has a couple of eclipses built into it to give us the opportunity to pause and be present to awakening. The lunar cycle began with a Solar Eclipse. The Full Moon on April 4 is the matching Lunar Eclipse. Eclipses help us enter non-ordinary states of being. They give us time to reset the systems, or have them reset for us by outside events. This Full Moon in Libra with the Sun in the opposite sign of Aries is a chance to reflect on relationship, balance, equity, equilibrium, and on the sustainability of our awakenings. Aries is used to acting alone, this first sign of the zodiac hasn’t really learned yet that other people are on the journey too. Libra, the mid-point sign of the year, teaches about the necessity of relationships and partnerships of all kinds on our journeys of discovery. The balance that relationship offers to Aries initiative is valuable. To welcome in that balance, with the potency of a Lunar Eclipse, we get to ask ourselves, “How will I reset the patterns in my relationships to support mutual awakening?” We aren’t alone. The opportunity is to realize this in profound new ways. Monday, March 30. When Leo is working well, this sign infuses our lives with wholeheartedness. The Moon in Leo encourages our vulnerable and brilliant parts to live wholeheartedly. In this sign, the Moon is conjoining Jupiter making the wholehearted mission even more important today. Jupiter encourages the re-inspiring story—the truth that invites us to a bigger worldview. The dynamic energy of the day finds support in the trine between Venus in Taurus and Pluto in Capricorn. Like dry soil soaking up rain, this transit encourages us to soak up the renewing energy of pleasure and power. Venus is feisty today making a square aspect to the Leo Moon. The opportunity is to integrate our bright spirits and our living bodies. Self-love comes in many forms. The Moon trines Uranus too, so we won’t be patient about any of this, especially when Mercury enters Aries in the evening (CDT). Mars is on its way out of Aries tomorrow but Mercury enters to keep the flame of awakening lit. March 31—Gibbous Moon: Perfecting. I am constantly making minor mid-course corrections in my practice of mindful intention. Adjustments are necessary. Some days I need to be a little more active, other days I need solitude and rest. Accessing where I want to go and where I am in any moment, I attempt to nudge myself in a supportive direction. All of us do this in everyday life and it seems to be a necessary skill on the spiritual journey. As the Moon enters Virgo at this “perfecting” phase of the lunar cycle, we are acutely aware of the small nudges we may need, however we may also be in danger of taking these adjustments too far, slipping into crippling perfectionism. Virgo is the Queen of small and many adjustments. This sign, when taken too far, is prone to over-analyzing. But when Virgo is shining best, this sign helps us look systematically and holistically at where we are and where we need to go next. Appreciate that gift over the next three days as the Moon travels through Virgo. Although Virgo and Aries (the awakening lunar seed of this cycle) don’t always rest easy with each other, both of these signs benefit from the challenge. Mars enters earthy Taurus and immediately trines the Moon in Virgo (also earth). This is a solid and noticeable change in energy. Mars in Aries has been pushing the wake up agenda of the last month and a half. Many have noticed an upswing in anger and impatience. Mars in Aries, along with Uranus, the Sun, and Venus for a while, provided the fire to keep us on the track of emergence. Now in Taurus, Mars slows down and asks us to stake our place on the Earth. Notice sensual urges and desires. The body has incredible ways to communicate. Most of the day is supportive in that earthy way. Late tonight, when the Moon squares Saturn, obsessive perfectionism might disturb restful sleep. I like to give myself permission to slow down when the Moon is in an earth sign. This may help you too. Wednesday, April 1. April Fool’s Day. This is a major holiday for me. No, I don’t like playing jokes on people, but I love honoring the Fool. The Fool and Aries (the Sun’s sign) have a lot in common. Both archetypes revel in leaping into the unknown. This foolhardy act is sometimes the only way we can move forward and it often is the only way to invite grace back into our lives. So, we know the cliché about Virgo (the sign of the Moon). This sign likes to be careful, have a good solid plan, and take little steps toward the goal at hand. But, I think Virgo is bigger than that. In honor of the Fool, let’s get perspective on those solid plans. Invite the unexpected, and even disruptive, coincidence to be part of your day. Virgo has the skills to discern the value of serendipity before anyone else. With the Moon opposing Neptune, we feel a loosening of rigid constraints anyway. With Venus sextile to Chiron, the opportunity to make soulful, compassionate connections to others, including all beings of this Earth, is part of the day too. Thursday, April 2. Even with the Moon in an earth sign, fire signs dominate the day. Mercury in Aries is trine to Saturn in Sagittarius and the Sun in Aries trines Jupiter in Leo. Recently, a predominance of fire sign aspects has contributed to volatility, anger, accidents, and agitation. This fire energy will feel different, dare I say, even hopeful? The Mercury/Saturn connection infuses our thinking and communicating with inspiration, humor, and meaning. If you need to reach out to someone, take advantage of the free flowing stream of ideas that may yield solid results with Saturn’s help. The Sun/Jupiter connection helps each of us to express creativity, authenticity, and hope. We could use that, right? Friday, April 3. We climb out of the details to get the big picture today as the Moon moves from Virgo to Libra. As an air sign, Libra needs and offers perspective. Libra also has a desire to get this perspective through other people. Just in time for Friday night socializing, the Libra Moon encourages fascinating interactions. Saturn plays along to encourage connections that feel solid and worth sticking with for a little longer. The opposition between the Moon and Mercury, however, reminds us that there is an edge to the balance between self and other. Tomorrow’s Full Moon Lunar Eclipse will further remind us that this struggle isn’t always easy. Use the better aspects today to practice collaboration and listening skills. 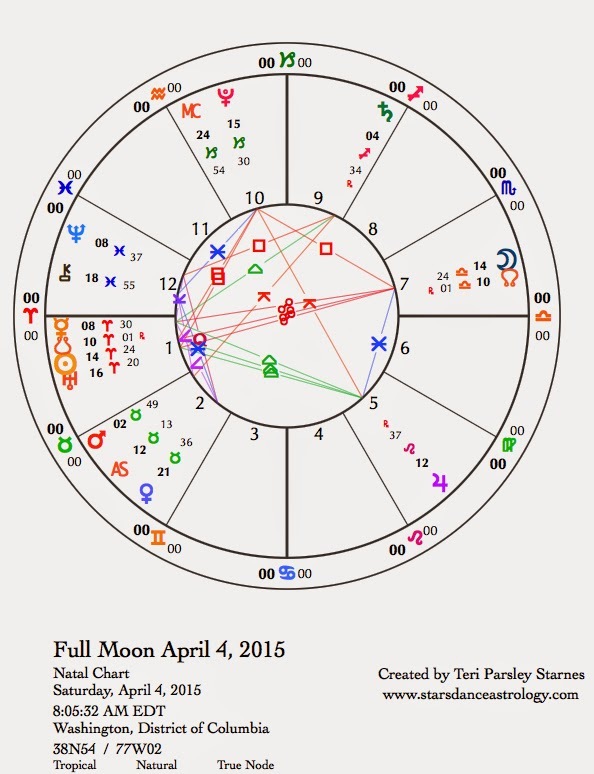 April 4—Full Moon Moon: Illuminating. Lunar Eclipse. Libra is frequently described as a sign that avoids conflict. This is true to a point. Libra often chooses to find the compromise or the diplomatic way to proceed through rough relationship waters. But not always. Sometimes Libra can be pushed too far. This Full Moon may show us that side of Libra. Libra’s symbol of the scales points out that this sign cares a lot about equality, justice, and fairness too. Since this Full Moon opposes the Sun in Aries, which is nearly exactly conjunct to Uranus and square to Pluto, none of us may be feeling particularly nice. And we will be looking for more fairness all around. In an eclipse, the light goes out for a short time, giving us an opportunity to pause and reset the systems. How are your relationships working for you? The focus now is on how those relationships are supporting (or not) our mutual awakenings. The Uranus/Pluto square, which has been written extensively about for the last three years, is again triggered at this Full Moon. Personal awakening is tied to political, cultural, and social awakenings. Perhaps there is no such thing as a purely personal awakening. With Mars and Venus in Taurus, we are ready to take a stand. We hear the voices of the wild, the Earth, and our very own bodies telling us what is really important. Jupiter in Leo, stationing to turn direct next week, encourages wholehearted participation in life. This isn’t the time to think of ourselves as too small to make a difference. Neptune and Saturn are opening the door to the exchange between form and substance. Forms may dissolve, but the truth wants to hold firm. The time is ripe for spiritual practice that helps us through these transformative times. Sunday, April 5. What was revealed when the shadow crossed the Moon yesterday? Even though we may not have actually witnessed this shadow, we felt it. Today’s transits encourage a deeper look at the shadows. First, the Sun in Aries squares Pluto in Capricorn. This dynamic could bring out power discrepancies. We could feel abused, misused, or just fed up with toxic relationships or systems of control. Since yesterday’s Full Moon activated a desire for fairness, imbalance of power may feel untenable. When the Moon enters Scorpio, we aren’t likely to let go of the resentment. Then, the Moon opposes bull-headed Mars in Taurus and we really dig in our heels. Sometimes, we need these types of wake up calls. Before making rash decisions, step into your own power. Contact Teri at teri@starsdanceastrology.com and visit her website at www.starsdanceastrology.com to learn about booking a reading of your chart.